1. Preheat oven to 400°. Prepare stuffing as label directs. Remove and discard giblets and neck from chicken. Trim excess fat. 2. Sprinkle inside cavity of chicken with 1/4 teaspoon salt, 1/4 teaspoon pepper and garlic powder; evenly fill cavity with prepared stuffing. Sprinkle outside of chicken with remaining 1/4 teaspoon each salt and pepper, and rosemary. 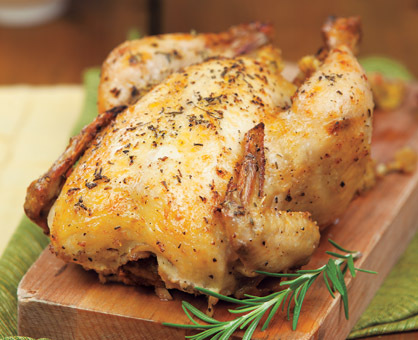 Place chicken in roasting pan; brush chicken with butter. 3. Roast 50 minutes to 1 hour or until thermometer inserted into thickest part of thigh and center of stuffing reaches 165°. Add rosemary sprigs and orange wedges to roasting pan during last 15 minutes of roasting, if desired. Transfer chicken to cutting board and loosely tent with aluminum foil; let stand 10 minutes. 4. Meanwhile, in small saucepot, heat crushed pineapple with juice and orange marmalade to simmering over medium heat. Simmer 3 to 5 minutes or until mixture thickens slightly, stirring occasionally. 5. To serve, with spoon, scoop stuffing from cavity and transfer to serving bowl; cut chicken lengthwise in half. Serve with Orange-Pineapple Sauce.